When it comes to relaxation and culture, Luxembourg City has something for everyone. Visit the Grand Ducal Palace, the iconic Notre-Dame Cathedral or MUDAM. You can easily reach Luxembourg's city centre both by public transport and car. 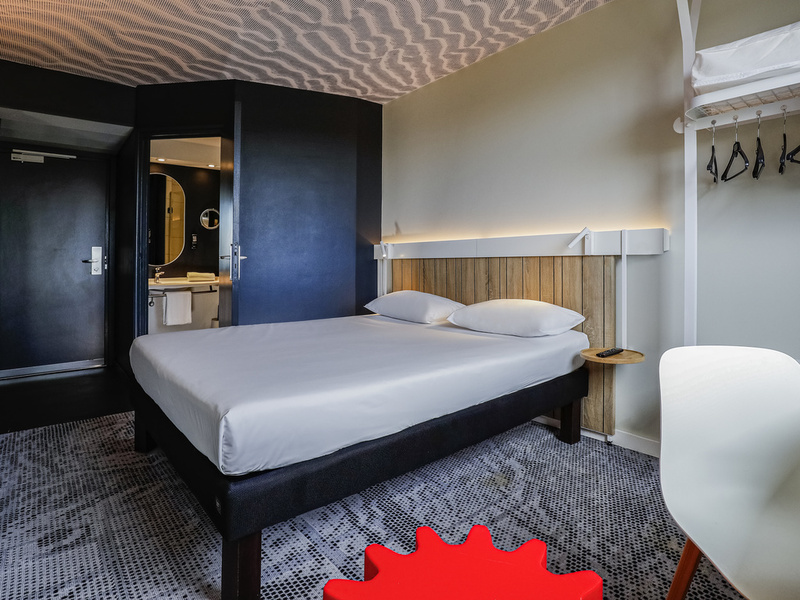 Ibis Luxembourg Aéroport is conveniently located for the European Business Centre Kirchberg, which can be easily reached by car. Golf Club Ducal du Luxembourg is just around the corner, for your ultimate relaxation. Comfortable new beds but poorly refurbished room. At first I was thrilled to be assigned a newly refurbished room. I really like the black and white design but the paintwork was poorly done. The new lamp and the new tv did not work. The room has a strange, completely empty entrance with no function. Oddly enough the really dated shower stall, which was clean but full of rusty stains, was not replaced. What is the Point of Checking-In Online and then Waiting at the Priority Desk? Accor makes a big thing about getting guests to check in online and then picking up their keys in the priority queue. Not one, but two, receptionists ignored my presence at the fast check in desk . Furthermore, I am a Gold Member. On the plus side the room renovations look nice. Room very comfortable and spacious. Staff very friendly. Excellent free taxi service each morning to the Auchene. Would highly recommend this hotel. Price/quality is fine. It would be better with a few small adaptions. Like having a tv map with a view of which programs to find on which channel. for example 1-30 is german programs, 31-35 is dutch channel etc... Other tip is disposable slippers would be great to have. I had a very nice room, where the window could be opened (a little), so I was very pleased as I heard from my colleagues that they couldn't open the window at all. During the evening/night I didn't hear any noise from the airport. Breakfast was good, delicious fresh pan cakes made me very happy. We were with a large group (17 rooms) checking in and this took a very long time (more than 30 minutes), as it took a while before a second employee came to help check in. Location is very good. Walking distance from airport, frequent bus outside the door to the town. Breakfast is average. Room very small, minimal, without even a shoehorn to put your shoes on. Despite the noise from renovation which would not let me work in the room, and despite the fact that I am a recurring customer, they would not let me check-out 3 hours later without paying extra money, although the cost was already high (145 Euro for single BB). This hotel is in a very convenient location. It is 5-10 minutes walking from LUX Airport. There is a bus exactly outside of the hotel with frequent service to downtown and a free parking lot for the guests. The management is not quite friendly. Although I am a recurrent customer of the chain, they would not let me check-out 3 hours later without paying extra charge, despite the fact that during the whole day, the noise from the refurbishment of other rooms wouldn't let me work - I was working during most of the day in the room. The room was ultimately minimal - very small, no closet, just hangers. not even a shoehorn to put on your shoes. Of course no slippers nor bath robe. Breakfast almost average. Cozy room. Good location. Friendly and helpful staff. Clean hotel. But there's a lack of USB chargers, or universal electric sockets/adapters. Also, heating worked but was a bit too hot during the night, and tried to switch heating to cooler air but did not work. Friendly staff, good breakfast and hotel good accessible by car. Downside was that window in hotelroom could not be opened and airco was not working and therefore room had unpleasant high temperature. It was terrible, lots of noise and poorly trained staff. Staff is very welcome, it may help that I stay 2 weeks per month. Breakfast is quite good and large choice. Rooms are quite acceptable although the conditions of the common areas are damaged( carpet) or look old. I am a regular guest of the budget hotel and this time I exceptionally stayed at the IBIS hotel in the same building. the welcoming staff is the shared with the budget and so the location. unfortunately the room was a bit outdated (chips and scuffs on the furniture) and not spotless clean as I am used to at the budget hotel in the same building. Overall satisfied but the price/room ratio does not stand other hotels around and in particular the Budget one. I stay in the Ibis Aeroport Hotel in Luxemburg many times each year. The staff is very friendly and service minded. The menu in the restaurant is not the most exciting but the food is tasty and well prepared. Even if our office moved recently, I stay at the Ibis quite often. Poor. Stuffy room. No air as no windows would open even a few inches. Bathroom was slightly dirty in places. Great staff, room was very basic. Staff were friendly and helpful but room was very basic. No plug socket near the full-length mirror which drives me mad as I couldn't dry my hair/straighten it in front of one, and there was no smaller dressing table mirror by the plug either, so a very poor layout for the ladies! Otherwise, wasn't too bad. Bed comfy and shower sufficient. I chose the hotel based on the proximity to the airport. Room faced the airport and road but was very quiet. Breakfast was good with a decent selection. I also liked the bus connection to downtown. I had a good meal at the restaurant. The items on the menu in English would have made the selection a little bit easier. Overall it was a very good stay. I will be back! It’s unacceptable to have no hot running water in the entire building throughout my whole stay and still charge full price!! !